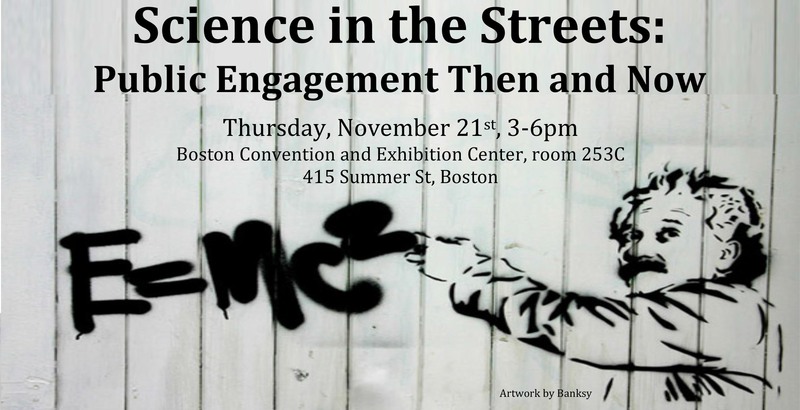 On Thursday afternoon, I started off with the Special Public Engagement Session: Science in the Streets, cosponsored by Boston University Center for the Philosophy and History of Science. This session consisted of two interdisciplinary panels aimed at exploring “innovative ways of connecting ordinary citizens with science, and how the history of science can inform and enrich these efforts.” Presenters included Brian Malow (the science comedian) and Ari Daniel Shapiro of the science podcast The Story Collider. Conevery Valencius Bolton from the University of Massachusetts, Boston did a fine job as an emcee for the session. I embarrassed myself on Twitter by tweeting an apocryphal anecdote from Caren Cooper’s presentation, in which she claimed that the word “scientist” was coined to describe Mary Fairfax Somerville who did not fit in the typical category, “man of science.” Fortunately, the twitterverse quickly corrected me. Rebekah Higgitt tweeted: “Not true!! Coined to describe men of science across a range of disciplines (happened to be in a review of Somerville).” She then tweeted this article (which, alas, also busts the myth that Ada Lovelace inspired the first computer). Mia Ridge tweeted “I’m starting to think we need a #histsci bot that tweets links in response to common misconceptions.” Good idea! Maybe someone could work on that for the next THATCamp? On Saturday, I was up bright and early for the Women’s Caucus breakfast. One topic that received a lot of discussion was the comparatively low number of articles by women in ISIS (approximately twice as many articles by men as by women). Part of the problem is the low number of women submitting articles in the first place. Someone suggested that another issue might be that men are more likely to revise and resubmit articles. I wonder if this is an issue with other journals? That afternoon, I presented my paper, “A Moonwalk for Women: The Women’s Health Initiative and Feminist Health Activism since the 1990s,” as part of a session on Women in Science. The term “moonwalk for women” was used by NIH director Bernadine Healy when she unveiled the Women’s Health Initiative (WHI) in 1991. The most ambitious clinical trial undertaken by NIH, the WHI was intended to be a fourteen-year, $625 million study of key health problems affecting older women, including prevention of breast cancer, heart disease, and osteoporosis. The WHI emerged after years of pressure from women activists in Congress, federal health agencies, and non-governmental feminist health organizations. Among the outcomes of their efforts was the creation of the NIH Office of Research on Women’s Health (OWHR) and Healy’s appointment as the first female director of NIH by President George H.W. Bush. In an article in SIGNS, Londa Schiebinger called these developments a “triumph for feminism,” but I argued that the reaction of feminist health activists at the time was more complex. For example, the non-governmental organization, the National Women’s Health Network, saw the NIH’s increased attention to women’s health issues as a “victory.” Yet they expressed disappointment that the ORWH ignored the viewpoints of women consumers in setting the agenda for women’s health research. They were especially concerned that the WHI privileged the interests of medical researchers, clinicians, and the pharmaceutical industry at the expense of female patients. I used the Network’s activism as an example of how feminist health organizations shaped health research policy and biomedical knowledge production in the late twentieth and early twenty-first centuries. Another highlight of the conference was a panel on the Pleasures and Dangers of Social Media. Here is Heidi Knoblauch’s Storify of the twitter stream. I was kidding when I tweeted, “If tweets are publications will they be included in ISIS bibliography?,” but apparently there is some serious consideration about doing precisely that. I hope Nathaniel Comfort carries through with his offer to conduct a workshop on the art of tweeting — maybe for the next HSS meeting? 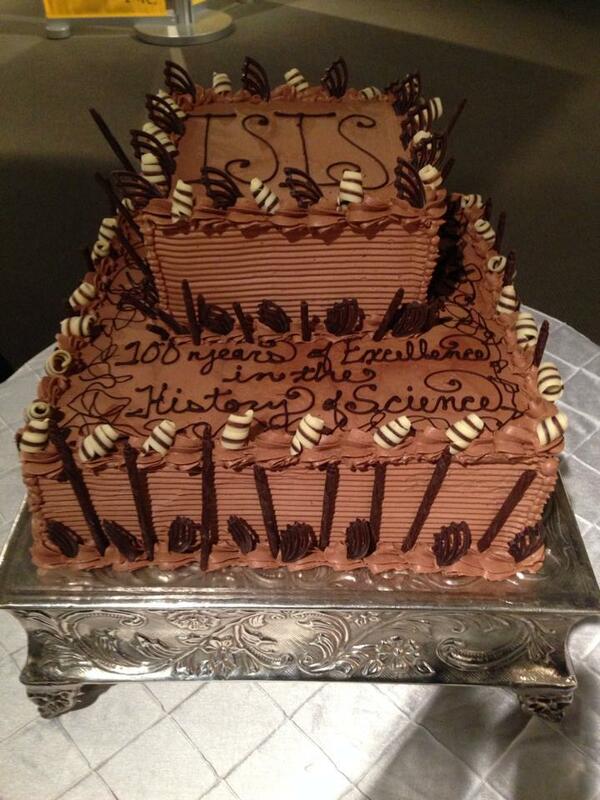 Saturday ended with a fabulous 100th anniversary reception for ISIS, the society’s journal, at the MIT Museum. Yes, that cake was as delicious as it looks. That’s it for my report. There was a lively Twitter back channel during the meeting (#HSS13). You can also read about the conference in the Harvard Gazette. Heather Munro Prescott is Professor of History at Central Connecticut State University. She is the author of The Morning-After: A History of Emergency Contraception in the United States, New Brunswick, NJ: Rutgers University Press, 2011.